Sleep is a much needed aspect of all the living beings. The sleep is not a dormant and inactive part of the life of a living being. The sleep is dependent on the hormones and also on the lifestyles, routine work of the person, stress, lights in the room, supper and also the amount of the television time. In the same way the sleep too affects the daily activities of the person. We can easily guess the quality of the sleep by the feel we get when we get up in the morning. If a person has slept soundly, then he will feel lightheaded and enthusiastic than a person who has not slept nicely. As to the question of how we sleep, the neurotransmitters play a very important role. There are many types of neurotransmitters and the most effective ones are serotonin and norepinephrine that keep a person awake. These two are produced by the neurons that link the brain to the spinal cord. The rest of the neurons began to trigger when a person falls asleep. Apart from that the neurons also tend to suppress the activities of the neurotransmitters that help us to be awake. It has been found that there is another chemical by the name of adenosine that gets accumulated in the bloodstream when a person is wide awake and makes him to fall asleep. When the person has fallen asleep the chemical gradually disintegrates. How to improve the Sleep?! The person, owing to the hectic busy schedule of the life in this modern world has deprived the sleep of the people and has made them to be always awake at nights. They are due to the stress and the depression factors that hinder the sleep hormones to be doing their work. The treatment for these factors is very simple. Yet some people go to the doctors in order to be treated. It has been said to be a waste of time and money. Trying the simple natural ways is very beneficial and helps in getting a good night’s sleep. Taking the use of the artificial tablets to induce sleep is like suicide because they affect the activities of the other hormones of the body and hinder their respective functions. 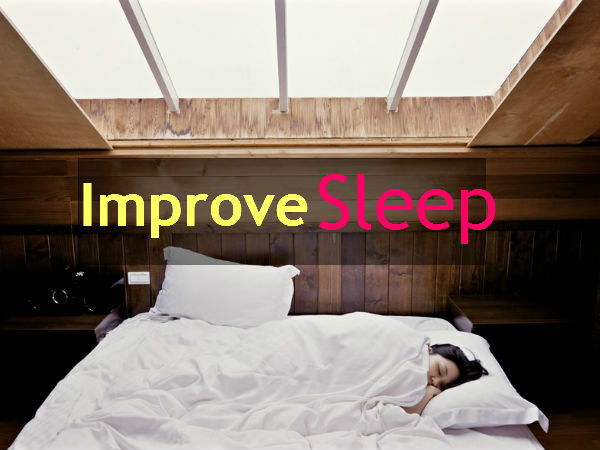 So it is a better idea to follow the natural ways to improve the sleep. Presenting the few tips that can be done at home. So let’s see the ways and ‘how to improve sleep’ ticks too. To sort any problem or complication first the problem must be clearly understood. Only then the problem can be analyzed and solved. This goes for the sleep problems too. The animals do not find any difficulty in falling asleep. In the same way the birds too do not fail to fall asleep. They fall asleep anytime and anywhere and get up whenever they like. But it is only the humans that do not get along in life and develop the sleep disorders and problems. People at night must clear their minds of all the negative factors and must keep their minds calm. Only then they will be able to have a good night’s sleep. The production of the sleep hormone, melatonin is essential for a person to fall asleep. But if that gets hindered by the other factors such as the PCOS, stress, use of drugs and worries then that adversely affects the body in many other ways. The endocrine system functions separately and hinders sleep if any obstacle occurs in the body. The stress hormones sometimes increase the rate of sleep in a person. Lack of proper sleep can result in the stress and it induces sleep. For a person to have a sound sleep, he/she must strive hard for that from the morning. Many factors play an important role in making a person to sleep properly. They can be induced by making slight changes in the food habits, lifestyle changes and exercises. Exposure to the light at the nights will also affect the nature and the quality of the sleep. Similar to the ways in which the foods impact the body in other factors, they induce the quality of the sleep in a person too. To have a good night’s sleep, there a certain set of foods that one must follow and other sets of foods that must be totally avoided. The foods that are cooked with coconut oil and olive oil and the food substances like the avocado, eggs, meat, butter and pasteurized foods all help in the essential building blocks of the body to be built nicely. These antioxidants cleanse the free radicals from the human body and also help in attaining good quality of sleep. The foods that are said to be inducing sleep are fruits, vegetables, broccoli and other beverages like green tea. For a person to get sleep, they must eat food about seven or six hours before going to bed. The food must be rich in proteins. The supper must be planned in such a way that the food is rich in proteins. The proteins that were eaten with the foods help a person to fall asleep faster at night. Stay away from these foods or use it in a minimal amount. The sugars taken at night will make a person to stay awake all night. The person will have difficulty in falling asleep. The sensation to eat chocolates in the evenings is the results of an underlying problem and it makes a person awake at night. The blood sugar level will also be raised. And in the nights, when the blood sugar levels fall down the person will stay awake. The wholesome grains are very important to the body but when they are processed they become very dangerous. Some people will develop intolerance to the grains when eaten and they will have to be neglected as they will alter the works of the hormones and affect the sleep. These are good components that are needed by the body but the oils in excess will make the people to develop the wrong building choices of the cells that in turn negatively affect the body and help in the infestation of problems. In this world today it is difficult to get the full nutrients because the quality of the soil has become less and the fruits are being plucked before they get ripe. This is done so that they can be transported across the world. So it is necessary to add some supplements to the food in order to have a good sleep. In a cup of any herbal tea, adding a few drops of coconut oil will make the person to be able to sleep at night. The main reason for the people to be unable to fall asleep is the deficiency of the magnesium in the body. The magnesium supplement is necessary to be taken in supplements so that the person can fall asleep in a time of about half an hour from the time of taking the supplement. The cod liver oils are essential in promoting the sleep because they make a person to fall asleep when taken in a day. The cod liver oil contains the nutrients like the vitamins A, D, E and magnesium. In case if a person takes a solid meal at night, the use of the herbs like the catnips. Chamomile and the sage will be necessary in making the person to fall asleep. The activities of a person at night as well as day can make a person to feel a change in his rate of sleep. It is up to the person to experiment different ways and select the right choice of activity that suits them best. It is essential to maintain the biological clock in the body at the same levels. Going to bed at one time and waking up at a totally different time will not only affect the sleep cycle, it will also result in getting stressed up. So the biological clock of the body has to be maintained. The intake of caffeine and other beverages affect the quality of sleep. It is normal to drink a moderate amount of the caffeinated drinks but these should not exceed the limits. If it exceeds then the person will be unable to sleep as the caffeine will interfere with the sleep hormones. The water must be drunk in excess during the daytime and at night no amount of water must be drunk or else the person has to wake up and use the bathroom. This hinders the sleep. No light of any form must be lit in the room where a person gets to sleep regularly. They must be replaced with the flux in order to have a good sleep. The supper must be has before six hours every night and the person must make it to be a habit. The amount of the food that one eats at the supper must be large when compared to the other lunch and breakfast. Before going to bed or on the bed it is wise to read a book that makes a person to sleep. It is equally beneficial to listen to a good music to increase the odds of having a good sleep. Having a salt bath an hour before going to sleep helps a person to fall asleep easily. The television must be switched off about an hour before going to bed. Because this will make a person’s to be awake and it will not be possible for him or her to fall asleep. The use of the artificial lights must be reduced in the bedroom. As a matter of fact the artificial lights must not be seen by a person after the sunset. Being exposed to the sunlight in the morning for about thirty minutes will increase the serotonin levels in the morning. As a result the melatonin levels will also be improved in the nights. The muscles must be stretched before going to bed. The stress must be reduced and the person must pray in order to reduce the stress levels. The cold therapy has become a popular one. It involves many ways of handling the cold. A person can either splash the cold water on his face several times or must dip his face in a bowl of cold water. Or he must place ice cubes either at the back of the neck or at the front to ease the nerves. The temperature in the room must not be so hot as to keep a person awake. Instead the cold must exceed the hotness by degrees of three or four. Every day the person must try to sleep in the same room. The above tips are very effective in preparing the mind of the person to be able to sleep night. The work differently for different people and the individual people must work it in their own lives to be able to feel them.